To sign up for the seminar click here. 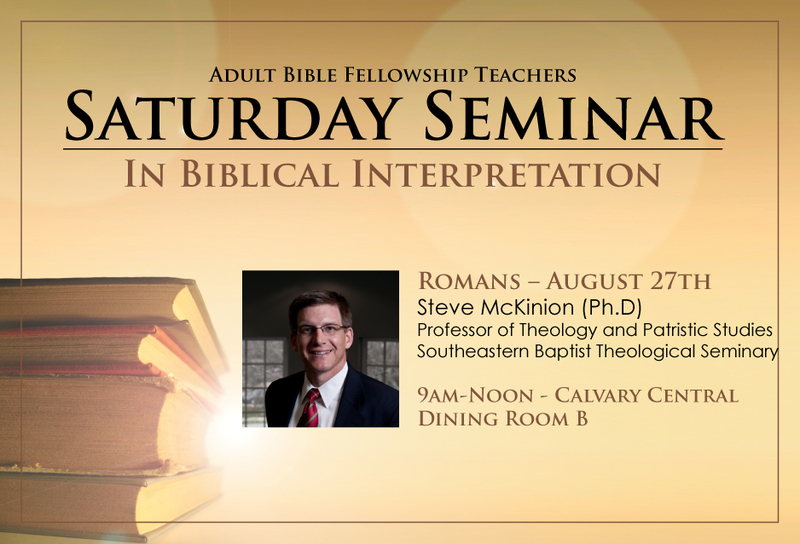 On August 27th we will have our 3rd Saturday Seminar in Biblical Interpretation on the book of Romans with Dr. Steve McKinion from Southeastern Baptist Theological Seminary, where he serves as a Associate Professor of Theology and Patristic Studies. Here is a little background information on Dr. McKinion from his personal website. He finished his BA at Mississippi College, his MA at the University of Mobile, and his PhD at the University of Aberdeen, Scotland, where he studied patristics with Iain Torrance. At age 27, after completing his PhD, he became a professor at Southeastern Baptist Theological Seminary, where he has taught since. He has also been a Visiting Professor at the University of Mobile, The Southern Baptist Theological Seminary, and Trinity Evangelical Divinity School. Steve has also helped lead several church launches, and is currently leading a new church startup in Raleigh called New Covenant Fellowship. Writing has been a big part of his life. In addition to the articles, dictionary entries, and books he has in print, he is currently completing two major projects: the Isaiah volume in the Reformation Commentary on Scripture with IVP, and Invitation to Historical Theology with Kregel. Dr. McKinion has already published the books Life and Practice in the Early Church, A Commentary on Isaiah 1-39 in the Ancient Christian Commentary on Scripture Series, and Words, Imagery, and the Mystery of Christ: A Reconstruction of Cyril of Alexandria’s Christology.